The Claryville Event Center, which opens on Saturday, will host weddings and other large events on the same campus as the Blue HIll Lodge & Cafe and the forthcoming Claryville Brewing Co. brewpub. Photo courtesy of the Claryville Center. 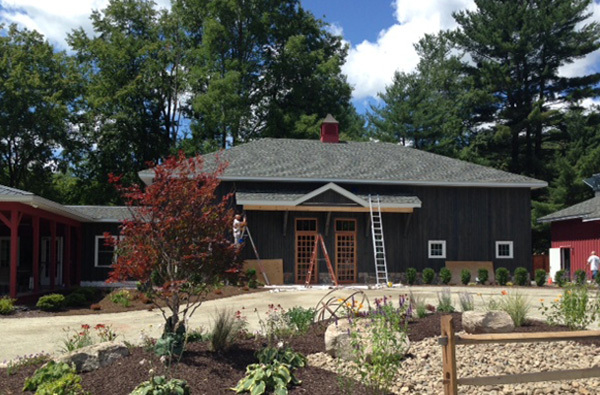 The Claryville Center complex in Ulster County will come one step closer to owner Frank Nicoletti’s vision of a full-service Catskills dining and lodging destination this week, with the grand opening of a 1,700-square-foot event space on the banks of the Neversink River. A public celebration kicks off at 2 p.m. Saturday, featuring beer, wine and food, along with music by Soundwall, a pioneering group led by three-time Grammy winner and saxophonist Rick DePofi. The party marks the debut of a new catering space to host weddings and other large events. The center is also home to a restaurant, the Blue Hill Cafe, and an inn, the Blue Hill Lodge, as well as the Claryville Art Center, which houses the permanent collection of Russian-American artist Alexander Kaletski. Over the winter, Nicoletti will complete construction and outfitting of a new building to house the Claryville Brewing Co., scheduled to open on Memorial Day weekend next spring. “The idea is that if you’re sitting in New York City thinking ‘What am I going to do this weekend?,’ well, here’s a place with art and beer that would be fun to go to,” said Nicoletti, who is an attorney in Manhattan. Claryville Center began as a bed and breakfast called Blue Hill Lodge, which burned down, was rebuilt, sold and eventually wound up in the hands of the Frost Valley YMCA. Nicoletti, who inherited real estate in Claryville from a great aunt many years ago, had always been fascinated by the lodge and bought it from the YMCA in 2007. Nicoletti and his wife Irina, who now oversees the day-to-day operations, developed a vision for multiple ventures in one location. They gutted and renovated the restaurant and lodge, moved an old barn from across the road and transformed it into the new art center, and constructed two new buildings for the event center and the brewery. The restaurant building also houses a deli/grocery and a liquor store. Nicoletti is also in negotiations to relocate the recently closed Claryville post office to one of his vacant storefront spaces, he said. “I’ve learned you can’t be successful as a small business in New York State, with the costs and overhead; you need to offer people a destination,” Nicoletti said. Claryville Center visitors find a fine-dining restaurant headed by chef and general manager Willy Mendez, who came from the New Age Health Spa in nearby Grahamsville. The lodge accommodations consist of a small hotel and a restored 1800s house, as well as a two-bedroom cabin on 10 riverfront acres nearby. The brewery plans call for a more casual menu of bar food to accompany house-brewed beers. Situated along the county line between Ulster and Sullivan, Claryville is a fairly remote hamlet without a lot of amenities. The Sullivan County town of Neversink is dry, guaranteeing the Claryville Center some thirsty customers. In 2017, if all goes according to plan, the $630 million Montreign Casino Resorts project at the old Concord Hotel about 25 miles away will boost the number of tourists headed Claryville’s direction. As he prepared for Saturday’s shindig celebrating the debut of the event center, Nicoletti said he’s hopeful his ventures will attract an appreciative audience. Find the Claryville Center at 1471 Denning Road, Claryville.